Here is the traditional 'Chitranna with garlic' recipe, kindly shared by Mrs. Sharmila Rao. Garlic rice is a tasty preparation with the subtle flavor of garlic and underlying sweet-sour taste of tamarind. This can be made with leftover rice as well. Alternatively, you can prepare garlic rice with freshly cooked rice as part of the feast menu. Just garnish the dish with cashew nuts fried in ghee to add richness! *You may use ground nuts (நிலக்கடலை) instead of cashew nuts. *Add red chilli powder if you prefer the dish to be hot. Reduce the number of red chillies to two, if you are using chilli powder, . Method: Wash and cook rice with 2 teacups (400ml) of water in a pressure cooker for 5 minutes or 5 whistles. Once the pressure subsides, remove from the cooker and allow it to cool on a plate. Heat oil in a kadai and add garlic pods. As they start to brown, add red chillies and mustard seeds. When the seeds start to sputter, add urad dhal and fry till the dhal turns golden brown. Add tamarind extract and allow it to boil. Now add jaggery, turmeric powder, red chilli powder, asafoetida, coconut and curry leaves and sauté for 1-2 minutes. Switch off the fire. Allow the masala to cool. 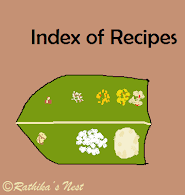 Add cooked rice and mix the masala with rice using a rice spoon (சாதக்கரண்டி). Heat ghee in a tadka pan/spice pan (தாளிக்கிற கரண்டி), add ground nuts or cashew nuts and fry till the nuts starts to turn light brown in color. Switch off the fire. Garnish with fried nuts and serve with curds.